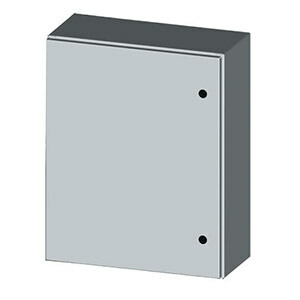 NEMA Type 4 Single Door Outdoor Electrical Enclosures and Cabinets. Sizes from 12x12 to 72x36. The SCE-4EL series electrical enclosures and cabinets are designed to house electrical and electronic controls, instruments and components. Provides protection from dust, oil and water. For outdoor application a drip shield is recommended. Three Point Latch Kits for Environline Enclosures 42" and taller, handle sold separately. Keylocking Handle for use with Environline Enclosures 42" and Higher, can be used with 3 point latch kits. Padlocking Handle for use with Environline Enclosures 42" and Higher, can be used with 3 point latch kits.